Why Do We Keep Things We Don’t Need? Everyone has a little hoarder in them. Although we may not be at TLC’s Hoarding: Buried Alive level, we all are guilty of keeping something that we know we should either throw out or donate. Maybe these items have sentimental value, you’re planning to sell them or give them as gifts in the future. No matter what the reason is, deep down you know that it shouldn’t be in your home. Here are some excuses for why people keep things they don’t need. Future Need. “I’ll use this one day!” Clothes that don’t fit, make up that you never use, and basically anything else that you haven’t used in the past 1 year, get rid of it! People think that saving stuff will stop them from having to buy it in the future. Only keep the essentials and what you absolutely need. If you haven’t used it in the past 1 year, chances are you’re never going to. Guilt and Sentimental Reasons. Yeah, I’m looking at your wedding and prom dresses! Vintage clothes that your mom gave you that you’re never going to wear, concert t-shirts, special dishes or glasses from a loved one that you don’t have space for. In order to declutter these items, you have to first understand that it’s okay to let go. Getting rid of these items doesn’t erase the memories that are associated with them. If you keep everything from your past, you won’t have any room for your future. Take a picture of the things that you know you should get rid of but keep anyway. Then, donate the items to charity or resell these items to someone that you know will take care of them. That way you know that your items are going to a good cause and you will feel better about giving them up. If you’re adamant about keeping some of these items, put them in storage so that they aren’t cluttering your everyday life. Plan to Sell. Another common excuse when it comes to keeping items that you know you should throw away is because you think you’ll eventually sell them. If this is the case, what are you waiting for? Put those items up for sale on Craigslist, eBay, Offer Up or Let Go. You can even have a garage sale. Give As a Gift. When you’re cleaning and trying to declutter your home, it’s easy to find things that would be great gifts for someone close to you. Sometimes those gifts never make it to the person and ultimately keep taking up space in your home. Be honest with yourself about your intentions. Did you really want to give these items as gifts or was it just another excuse to keep them? If you really want to give them to someone, set a date! Call them up and go out for coffee or a walk around your neighborhood and then give them the gift. 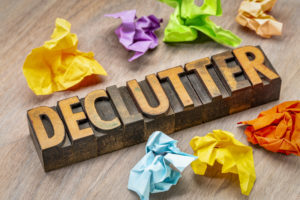 It’s a great way to reconnect with that person while getting rid of the items that are cluttering your home. Oh that’s the good (Insert item here). So many people only use certain items during special occasions like dishes, silverware, china, and crystal. While it’s enjoyable to be able to celebrate milestones by using the good dishware, every day you wake up should be a celebration! If you keep waiting for the perfect moment to use that crystal your grandma gave you or the china you received as a wedding gift, you may wait too long and never be able to use them. Harsh, but true. Don’t let excuses clutter your life! For more information about storage options visit www.storexpress.com Stop by any one of our 10 locations for a tour to find the storage unit that best fits your needs!